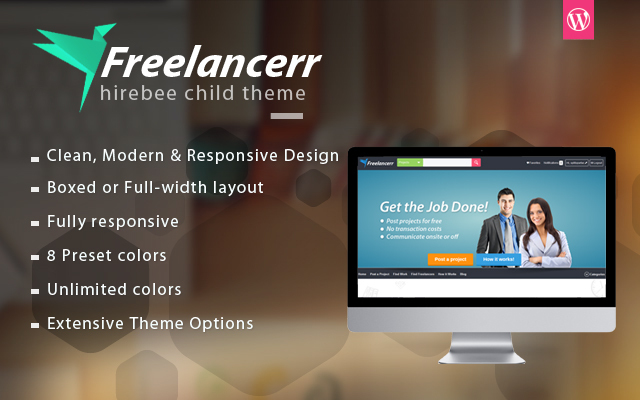 Freelancerr is an elegantly crafted and fully responsive premium Hirebee child theme. With a clean and professional design, Freelancers makes a great solution for a freelance marketplace website like Freelancer.com, Elance ,odesk. We carefully handcrafted this theme with strong focus on the user experience to make it a pleasure to use and worthy to do a good business. 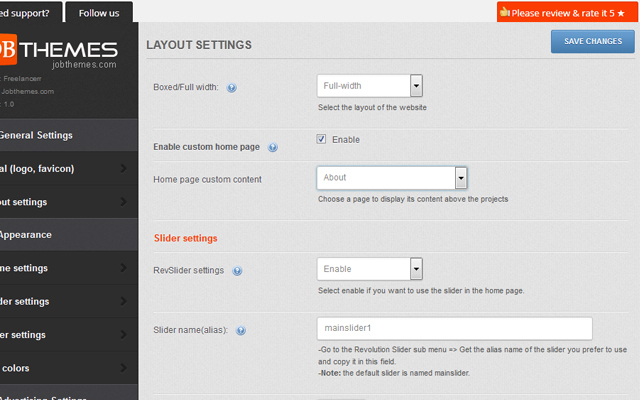 Freelancerr also provides a rock solid theme back-end with tons of useful tools and options. 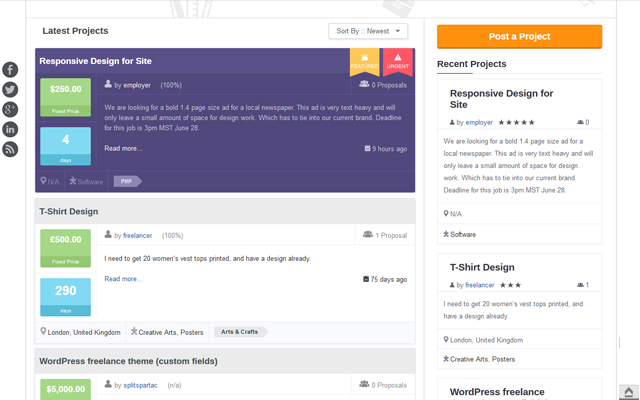 Modern, Clean & Professional design: Freelancerr has a very fast and clean UI and design. It provides a very user-friendly design which results in a great user-experience. Responsive layout : Freelancerr has a responsive layout compatible with all devices. 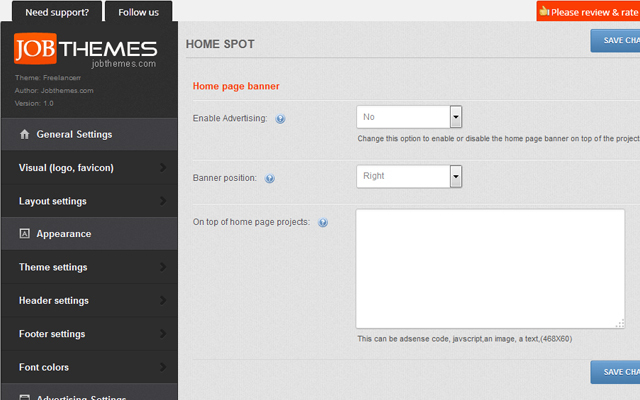 Try it yourself, while browsing the theme’s demo resize the window to see how it automatically adapts. Full-width or Boxed : Either Full-width or boxed, There is an option for that in the admin panel. 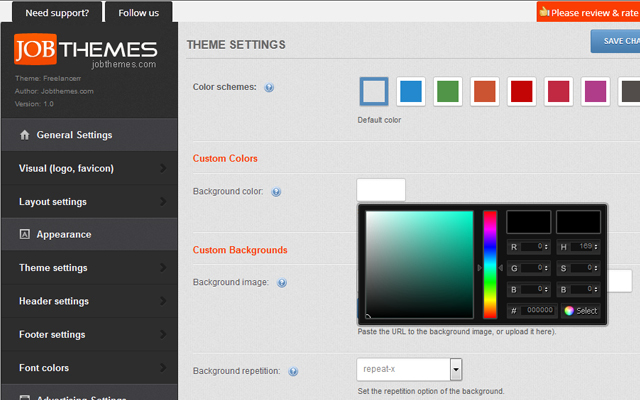 Unlimited colors: You can change colors and styles, and customize your Web site to the last corner. Revolution Slider included [$19 value]:The most advanced responsive slider with powerful options panel is now included in Freelancerr with a one click install. There is an option to display an awesome slider in the front page’s banner. Advertising module: More over than the default Hirebee advertising spots, Freelancerr is packed with enhanced advertising modules that helps you to turn your site into a hits generator. 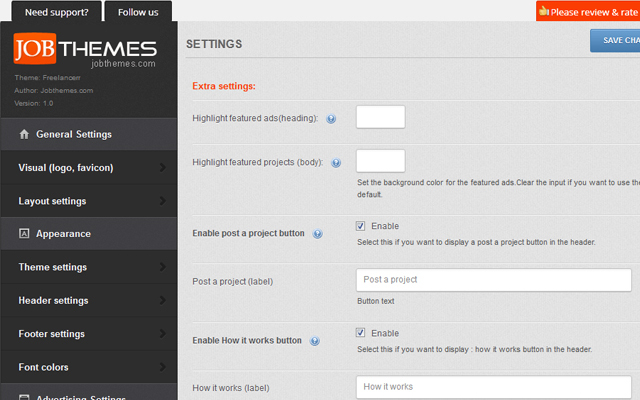 Custom styles: You need more customization?, You can add custom CSS directly to the from admin panel. 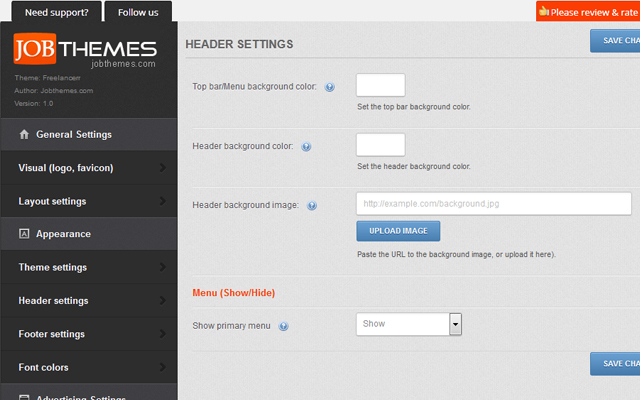 It allows you to change theme look without editing core theme files. And what is important, custom CSS rules are stored in database and will be saved after theme update. Localisation support: Freelancerr is ready to be translated into any language you want using the .po/.mo files. It uses the same language pack of Hirebee. Compatible with Hirebee 1.2.0+: Freelancerr is completely compatible with and the functions of the latest version of Hirebee. -Your Freelancerr now is installed and ready for use. We are very happy with the performance and support. This is exactly what I was looking for, Spartac you did it again. Keep it bro..
*categories stay on always on the mobile*. I guess your team already have the fix patch. Could you please forward the fix to me ! can you please send your url by email to support @ jobthemes.com, I will take a look and fix it, I will find out if that reported bug was fixed or not. I understand, but very disappointed discover existent old issue. Have send email to support jobthemes, waiting for their response. child theme, meaning should be tested before integrated into theme. Hi Spartac, regarding the issue, *categories stay on always on the mobile*. I have not received any response from jobtheme yet ! if I close the function categories list will not appear for any devices. appreciated to have fix code. Regarding the RevSlider I did solve the mobile issue, But I need RevSlider purchase code / license key to be able to update to latest version, could you please provide me the license key. Installed version is 4.6 need to be updated to latest version 5.2. Hi Spartac, Considerate my timezone +2 GMT. (( we would debug it there and fix it for the next release)) That bug exist since 2015 no release in two years. Not sure anyone realizes that will damage Appthemes reputation. My suggestion remove Freelancer-theme from Marketplace and put it up when is fixed. I removed Freelancer theme from my site, too bad I did like theme but can’t advice other to purchase or offer to my client. and since last time, I did promise you to include it to the theme update release.and we have already fixed it and going to upload the files to the marketplace dashboard in few minutes. one more time, it was our mistake to hook into that hirebee function which shows the categories list expanded when viewing on mobile. I understand your disappointment, and yes it took us a while to figure out what was the issue in real because at the first glance we didn’t see it. I hope there is a way to forgive our delay, it’s not like us, trust my word. just this one case along with too many tasks to do and more themes to update, but yes, the bug is a bug. i have purchase the theme freelancer and i love it. I have it installed in my local server and its works great but when i tried to installing it in my web server its doesn’t work? and gives me this error. Please i need your help as quick as possible. delete the revslider you installed using the tgm bulk action, then go to add new plugin => browse the plugin on your local machine freelancerr/includes/install/ you find there the revslider plugin zipped. upload it as if you are installing new plugin. and activate it. tell me if this worked. Hello @mazlaghn sorry my bad. Hello @spartac no itdidnt work, but i have solved the problem, its seems that was the version of PHP used in my server adavnced so its required some changes in class-tgm-plugin-activation.php file. Thanks for your quick replay i really appreciate it. So if there is an update to fix tha,t its will be awesome. And thanks again for your support. We will prepare a fix for that in the next release. I would like to know if you have any spanish translation .po file for Freelancerr child theme part? I have the hirebee theme spanish language .po file but there are some parts from Freelancerr I guess that are not translated. 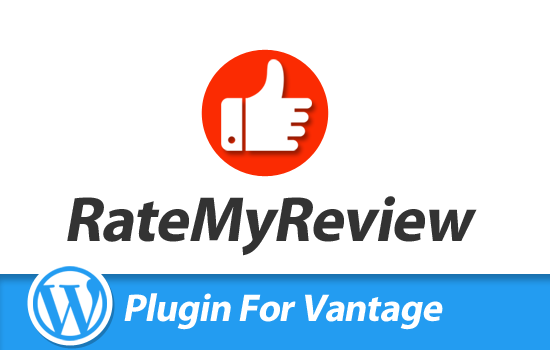 Any news about Hirebee Bridge Plugin for WPML? Do you know if there ara any shortcodes to use, like recent projects or freelance list or any other? Somehow in Freelancerr Options the Enable post a project button can not be disable even if I uncheck the Enable box. Do you know why and how to fix it? if you want, I can help to get the non-translated words in one file andy ou translate them yourself. If could get the non-translated words in a file pot for me I would appreciate it, I could translate. And please let me know about the current wpml bridge. I am going to send you the file by email. Yest please, I really need it to translate it all into spanish. We are sorry for the late reply, we have been running through some hosting technical issues and until today we could restore all our emails. I am not sure if you did, but can you send your Spanish .po file you use with hirebee. I will update the words missing from freelancerr theme, there must be a glitch where the framework didnt catch the words . you want to chantge the font size of the content, or which part of the website? Hi. Sorry, I have a basic question. What additional features/ capabilities does this Freelancerr child theme provide to the parent HireBee theme? How does it enhance/ improve the parent theme? besides the very different look and feel and the interface of hirebee which is enhanced on Freelancerr. 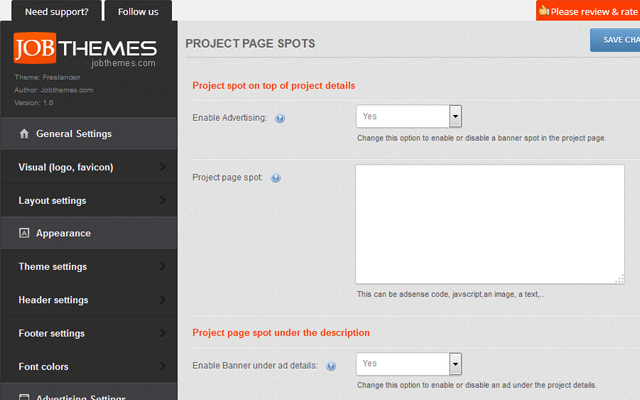 Regarding the options/functions, we have added featured projects slider , and advertising spots module and other little functions here and there. But mostly, we based our work on the appearance. Various items in the demo of Freelancerr not working. Can you check and advise? 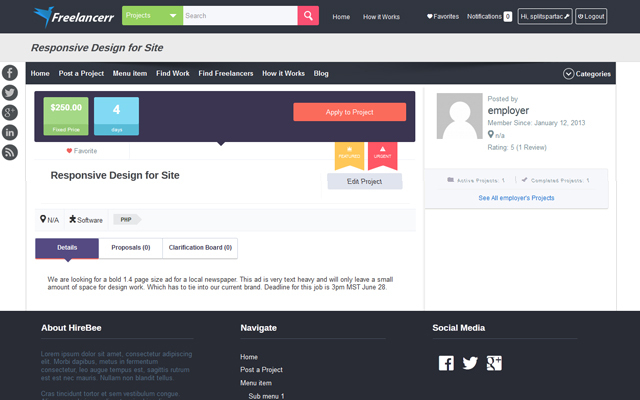 Find freelancer, find work, etc…comes up with hirebee layout not freelancerr. Also, when you try to post…you have to scroll through the categories first before you see the form. As soon as slider plugin is installed, the admin area gets inacessible – HTTP ERROR 500. Is there a problem with the demo site? It looks like it has been customised with a strange background and logo. Please can you restore or provide a different demo link? I am going to check that out and fix it.